Details relating to the Latvian Commemorative of 2018. 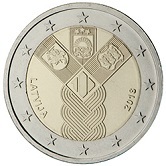 This coin commemorates the establishment of the state of Latvia. It is one of a joint issue by the Baltic States Estonia, Latvia and Lithuania commemorating/celebrating their establishment or in the case of Lithuania its re-establishment. The basic design is the same for all three states – a braid shows the three Baltic states as intertwined with a common past, present and future. The intertwined braid opens up at the top revealing its three components – on the left Lithuania, in the middle Latvia and on the right Estonia. In the very centre of the coin in a diamond shaped background is a stylised numeral representing the 100th anniversary. The countries are represented by their coats of arms. On the left Lithuania - a knight on a jumping horse, with a Lorraine cross on the shield. In the middle Latvia - rising sun, lion and a griffin. On the right Estonia - three leopards. On the edge of the inner circle between three and four o’clock is the year of issue “2018” and between nine and eight o’clock is the name of the issuing country, in this case “LATVIJA (Latvia). This, the name of the country, is the sole distinguishing feature of between Estonia and Latvia. For Lithuania two additional differences are a mint mark to the left of the braid at nine o’clock and the initials “JP” of the designer (Justas Petrulis) to the right of the braid at three o’clock. Return from Latvian Commemorative 2018 to euro coin collector.